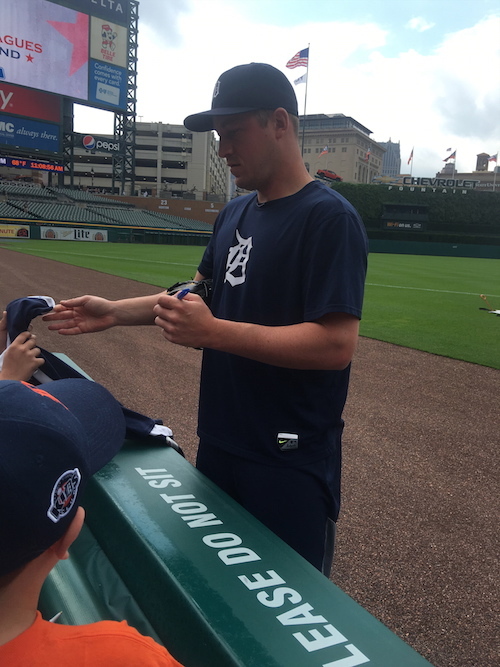 Earlier this season, Michigan based iFolloSports.com correspondent Lance Martinez gathered this original photo of Tigers pitcher Jordan Zimmermann signing autographs, prior to a game at Comerica Park in Detroit. Notice how the righty hurler is signing his signature with his left hand. Zimmermann, a Wisconsin native, starting his career with the Nationals, before signing a five-year/$110 million contract with the Tigers last offseason. His Nationals résumé featured two All-Star appearances, a 2014 no-hitter and the 2013 NL wins title, after posting a 19-9 record. So far this season, the 30-year-old Zimmermann is 9-4 with a 3.81 ERA and 1.20 WHIP, for the 39-38 Tigers. For his career, the Wisconsin-Stevens Point alum owns a very impressive 79-54 record. Detroit sports fans can check out numerous other behind the scenes stories, chronicling the city’s sports scene, over the last several years.